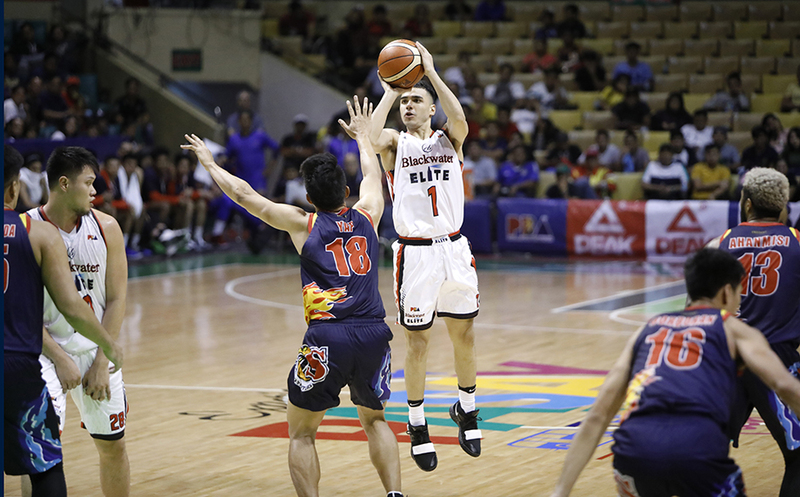 The Blackwater Elite picked a great time to get their first win. They put on a show in the second half to hand the Rain or Shine Elasto Painters their first loss. The Elite beat the Elasto Painters, 111-99. Mike DiGregorio and Allein Maliksi formed a potent back court scoring punch. DiGregorio waxed hot from beyond the arc. He exploded for 27 points on 7/10 outside shooting. Maliksi struck from all over the court. He had 23 points with seven rebounds and two three-pointers. James Yap led Rain or Shine with 20. Early in the game it was the Elasto Painters that held the advantage. From a 39-39 tie, Yap led Rain or Shine to a 9-0 run. He sparked the run with a three-pointer and capped it off with two free throws. Yap nailed a step back jumper late in the first half to give Rain or Shine their biggest lead of the game, 53-42. DiGregorio and Maliksi led the comeback in the second half. The two combined to form the bulk of a 13-0 run at the start of the third quarter. The two traded baskets to start off with an 8-0 blast. James Sena added two free throws to tie the game and DiGregorio nailed a three-pointer to give Blackwater the lead. The rest of the team joined in on the scoring. Roi Sumang and Chris Javier pushed the Blackwater lead up to seven before DiGregorio nailed back-to-back treys to keep their lead at 10. From there, the Elite got production from Mac Belo and Abu Tratter to help keep Blackwater ahead. Maliksi and DiGregrio also combined to give the Elite their biggest lead of the game. Midway through the fourth Maliksi scored five straight points to push Blackwater’s lead up to double-digits. DiGregorio added a three-pointer and Maliksi scored on an and-one basket to push the lead up to 18. The Elasto Painters couldn’t overcome that deficit until the end. In the second game, the Meralco Bolts rallied from an early 21-point deficit to beat the TNT KaTropa 88, 77. The KaTropa started the game on fire. Don Rollano and RR Pogoy kicked off the game with big baskets to form a 13-0 run. The Bolts couldn’t get their offense started as they only managed nine points to start the game. 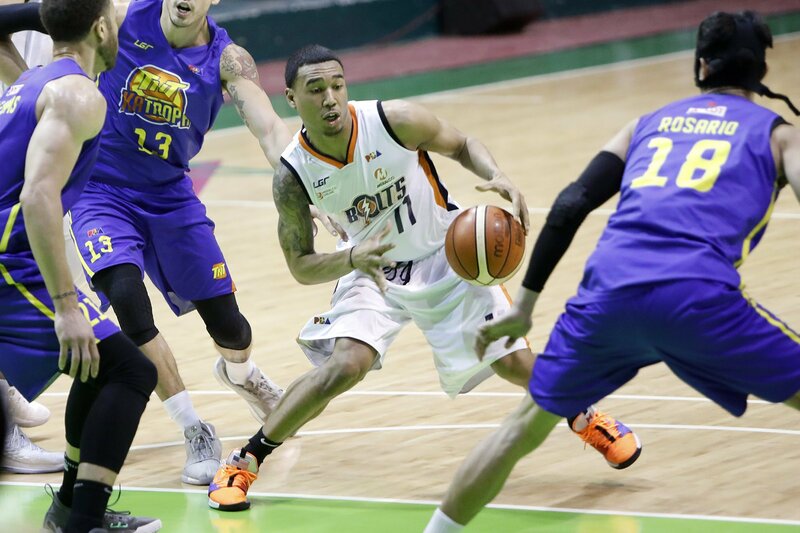 Jayson Castro led the charge in the second quarter. He scored nine straight points to open the period and push the lead up to 21, TNT’s biggest of the game. They looked like they were in full control of the contest, leading Meralco 30-9. But the Bolts refused to let TNT get away with the win. They slowly chipped away at the lead as their forwards finally found their range. Jared Dillinger, Ranidel De Ocampo, Cliff Hodge and Nino Canaleta all scored in an 11-0 Meralco counter to cut the deficit down to nine. They were able to keep Meralco at bay and stay within striking distance heading to the half. In the second half, it was the guards that took over the game. Chris Newsome and Baser Amer provided steady production that cut the TNT lead further down. Amer nailed a three-pointer to give Meralco their first lead of the game with three minutes left in the third. Meralco took a five-point lead heading into the final period. The Bolts took over the game in the final period. Newsome, Amer and Nico Salva all teamed up to go on an 8-0 run to open the fourth quarter. Their five-point lead ballooned to 13. After Trollano scored on a layup to cut the deficit down to 11, Dillinger and Newsome went on another 8-0 spurt to push the lead up to 19, their biggest of the game. Meralco held on to the advantage all the way to the end. Newsome led a balanced effort with 20 points on 52% shooting. Amer added 17 off the bench. Dillinger scored 16 while De Ocampo and Salva scored 11 each. Castro led the KaTropa with 20 points.